I’m developing a new series of Antarctic watercolors and am enamored with my memories, field sketches and photographs of vast skies and luminous light. I’m planning to work fairly large (30″ x 15″) to help capture the sense of scale I felt down south. 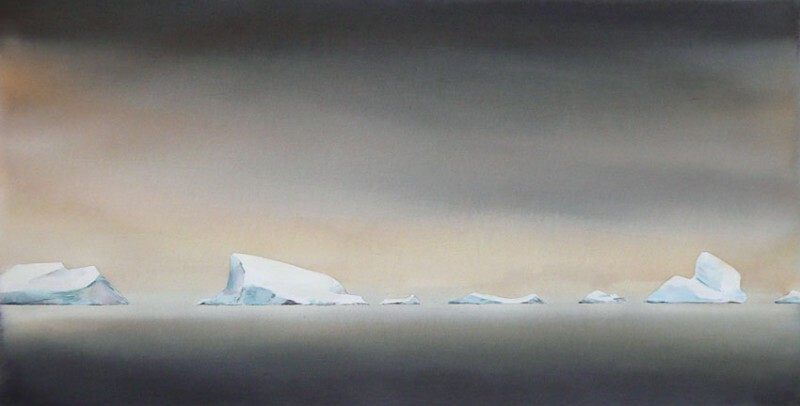 Last week I completed one painting, using multiple glazes and masking for icebergs. My inspiration for this particular piece is Pleneau Bay on the Antarctic Peninsula ,where I enjoyed a calm day with low clouds and soft light last year as artist-in-residence with Quark Expeditions. 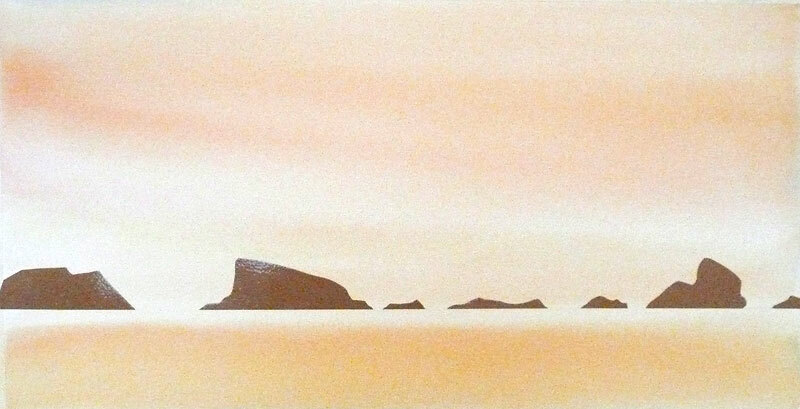 Earlier, I’d completed a watercolor outside as the ship left the Lemaire Channel and I was captivated by the light. Since then, I’ve been excited to recreate that same quiet atmosphere in my studio. One of my photos with a stately row of icebergs caught my eye. With Photoshop, I experimented with different crops, and viewing it black and white. I also tried several photo filters to explore possible overall tones. I was delighted by a warm orange filter and especially liked the contrast between the warm, nebulous sky and the cool, crisp icebergs. I sketched out a larger version and used two strips of overlapping masking tape for the icebergs. That was a mistake! After I’d carefully completed a number of washes, I removed the tape and was disappointed to see that the paint had leaked through the overlap. I was frustrated, since I loved how the sky and water turned out. Time to try again… This time, I used brown packing tape which I placed on the paper and carefully cut away with a razor blade. I then wet my paper completely with a 3″ hake brush and painted my first wash with Daniel Smith New Gamboge and Pyrrol Orange, using both my big brush and a smaller 2″ hake brush. (Both are hand-made by my Japanese brush-maker friend Mr. Sakuma. Read more about him here.) I lifted paint with a damp flat brush under the icebergs to keep some brights for the water and give the painting more depth. I allowed the paint to dry. This is the important part! It can be so hard to resist messing around with the paint (patience, patience). Often I’ll work on multiple paintings at once to keep myself occupied. For my next wash, I again wet the paper (at least the sections I planned to work in) using a clean brush and clean water and quickly applied a mix of Daniel Smith Indanthrone Blue, Quinacridone Gold, and Deep Scarlet. The paper did buckle some as my washes dried, but if flattened out in the end and the paint dried smoothly. I repeated one or two more glazes of darker paint until I finally took of the tape. It was clean! 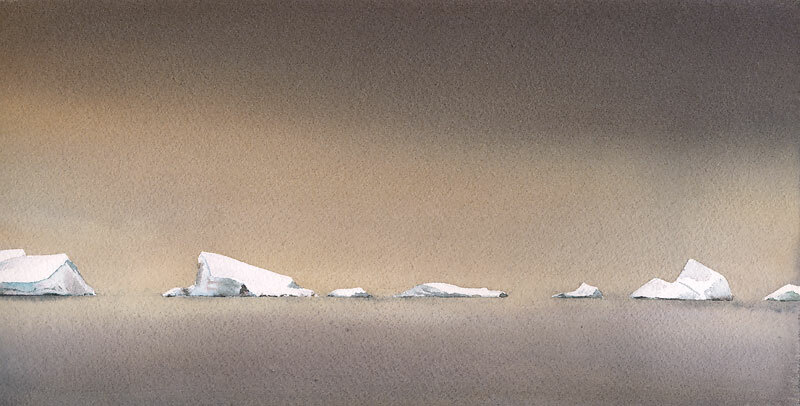 (whew) I completed painting the icebergs and here is the final. I’m to frame the piece this week and hang it at the Pacific Science Center for Polar Science Weekend where I will be exhibiting February 26 – March 1st. Come by and say hello!